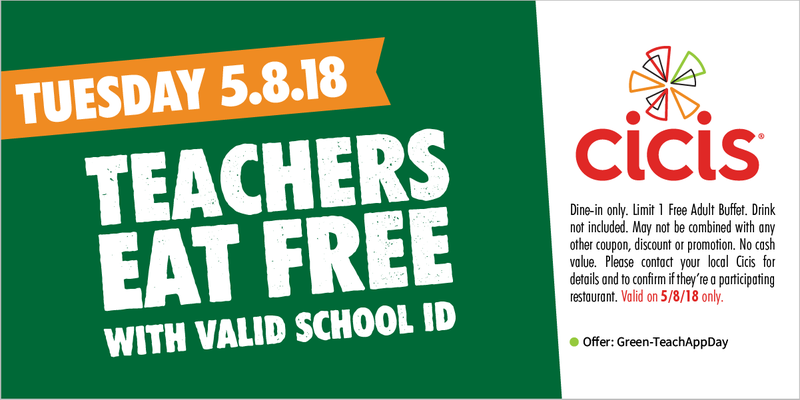 Teachers Appreciation Week is here, and lots of places are offering awesome deals! After all, teachers are so amazing! Every inch of work they put in for our children is truly appreciated. They are shaping our future professionals and we couldn't be more thankful! These are just some of the places offering deals exclusively to Teachers. Chick-Fil-A: Teachers can get a free chicken sandwich on Tuesday! Check with your local Chick fil a! Cicis Pizza: Free buffet? No way! When you dine in on Tuesday with a coupon! Chipotle: Did someone say burrito? Tuesday after 3p.m teachers can get buy one get one free burrito, bowl, taco order or salad! Costco: When purchasing a new membership, teachers can save up to $60! Michael's: With this 15% off coupon, the possibilities are endless at this amazing craft store, not to mention sale items are included. Barnes and Noble: Here you can get 25% off during Teacher Appreciation Week! But that is not all, you can continue to get 20% discount throughout the year! AMAZING! Ann Taylor/Loft: OMG! 15% off full price purchases! J.Crew: Save 15% percent off your purchase, just bring your school I.D! Banana Republic: 15% off on full priced items! Sprint, Tmobile and Verizon: Disounts on your telephone bills! Sea World: A complimentary pass will be given to all teachers with credentials! Check all local businesses to double check on participation! Cheers to Teachers!